I’ve been asked to help lead a town wide mission for 10 days called Love Bicester in May 2014. The vision is to love and serve the people of Bicester in such a way that it shows the good news of Jesus. I’ve already had the joy of joining church leaders for breakfast and a consultation and to hear what is on their hearts for their own town and to catch hold of how to help enable a mission. What we have come up with excites me and terrifies me all at the same time as it is a new thing, and we’ve planned to take some risks! I’ve also got a hunch that this will have a huge impact upon the people of the town. So, what’s so novel about the way the town wide mission will be done? We won’t have a ‘speaker’ whom we focus on, an expert to do the job of mission, but rather every one will have a go at reaching out to those around them. The goal is for 100 activities run throughout the love Bicester week that will be designed and run by the small groups themselves. No one will prescribe what the groups can do, although suggestions will be available ranging from running a community BBQ to putting on a musical event at a care home to offering prayer to every home in their locality or being there to listen to people. 2. Love Bicester will be ongoing and lasting. Not just a one off where Christians can tick off and then stop serving their community! It’s been said of mission that it is something Churches spend 2 years planning for 2 weeks activity and events to then take 2 years to recover before they decide again to do another one, which takes 2 years planning! 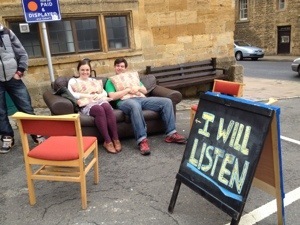 Love Bicester is about equipping the saints, raising the confidence of the church to creatively do mission. 3. Lastly, this is about adventure! We are hoping for 100 activities/ groups to do something to show their faith. Each group will communicate what they do with a central administrator who will then communicate with all the groups. Where there is cross-over groups will be asked to work together. Where an individual had an idea but is looking for help, people will be joined together from different churches to do something! I can’t wait to see what happens with this- But first, I must write a 6 week bible study course that will take people along on that adventure. Would love to get a copy of the study (once it’s written! )-our small group was only saying last night how good it would be to have something to study around enabling mission! A novel way of doing mission Chris – I’m sure it will inspire those involved to be creative and take a lead role in doing mission on a long term basis – Nice one mate – I’ll certainly pray and keep me posted so that we can remember you leading up to May. Thanks for your encouragement- yes I shall keep you posted! This sounds really interesting and like to get involved.